A lady in my ward shared some toffee with me that she had made and I fell in love with it. Her’s had no nuts on it, but I added almonds for an extra a nice touch. It was right around Christmas time, so I decided that “Neighbor Gifts” was the perfect excuse to make some. I really did give toffee to my neighbors, but I am sure that my husband and I made most of it… well, most of the first batch. I had to make a second batch for the neighbors… :) It is incredible! And it is very easy to make too! It can be a little harder to make if you don’t have a candy thermometer, because it may be too hard or too soft, but you can always use the cold-water test, and you might get close enough… I tried it twice. Once it turned out perfect and the second time it was too soft. So like I said, a candy thermometer makes things much simpler, but you can do what works for you. Rub a 9×13 pan or a cookie sheet with one of your sticks of butter, to coat the pan. Melt the butter in a sauce pan, then add the sugar and the water. Stir with a wooden spoon until the sugar dissolves, then turn the heat up to medium. Using a candy thermometer, stir until the mixture turns golden brown, and the thermometer reads 270-300 F. If you are doing the cold water test then drop a little bit of toffee in cold water and the toffee should turn hard and brittle. Remove the mixture from the heat and pour into the pre-greased pan. Let the toffee spread itself out a little bit (you don’t have to spread it out) and let it cool for 5 minutes. Sprinkle chocolate chips on top of the toffee, after it has cooled for the first 5 minutes. Wait another 5-10 minutes for the chocolate chips to melt, and then spread the chocolate over the toffee. Sprinkle the chopped almonds over the chocolate and lightly press them into the chocolate. 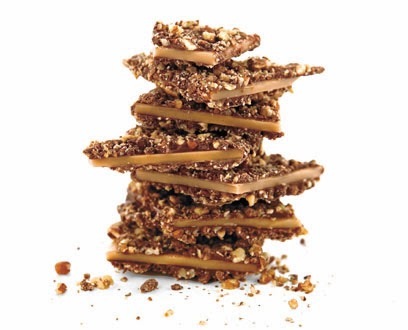 Let the toffee cool completely, and then break it into pieces for eating. :) Yep, the best part of all! Of course.